Atheist, agnostic, humanist, secularist, skeptic, empiricist, Ockhamist, and Patafarianist are all different flavors of the philosophy of life my wife and I share, but Vicky and I prefer the term “Spiritual Naturalist” to describe the deeply fulfilling sense of wonder we get from engaging the natural world around us. 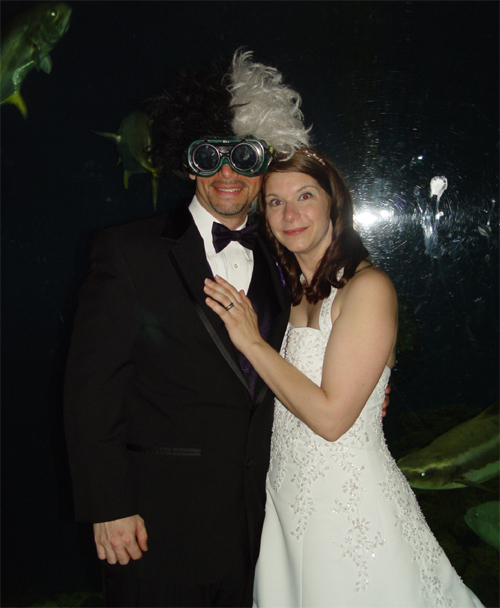 This ionian enchantment, as it’s known, emerges from an understanding that our reality is comprehensible through natural scientific laws, and just as members of the plethora of diverse religions of the world celebrate their spiritualism in sanctifying their marriages, we wanted to celebrate our sense of wonder for the world on our wedding day. I prefer rationalism to atheism. The question of God and other objects-of-faith are outside reason and play no part in rationalism, thus you don’t have to waste your time in either attacking or defending. Asimov was an avowed atheist in the context of his personal feelings, but the point he makes here does illustrate the flaw in rationalists even bothering with atheism, because it has no place in Empirical thought. While continual rejection of theist attempts to impose their irrationality on society remains imperative, taking a position of promoting atheism is equally irrational. The theism/atheism debate has no place in rationality whatsoever. In other words, a Scientist who has the time to be an atheist isn’t doing enough science. John Coleman, weatherman for KUSI in San Diego, has an unintentionally hilarious rant posted, Global Warming and the Price of a Gallon of Gas, where he blames Global Warming Theorists for the high cost of oil and what he seems to think is the impending destruction of civilization because of it. Mind you, it’s not Global Warming that’s going to destroy civilization, it’s people believing it that’s going to doom us all. I have dug through thousands of pages of research papers, including the voluminous documents published by the United Nations Intergovernmental Panel on Climate Change. I have worked my way through complicated math and complex theories. According to Mr. Gore the polar ice caps will collapse and melt and sea levels will rise 20 feet inundating the coastal cities making 100 million of us refugees. Vice President Gore tells us numerous Pacific islands will be totally submerged and uninhabitable. He tells us global warming will disrupt the circulation of the ocean waters, dramatically changing climates, throwing the world food supply into chaos. He tells us global warming will turn hurricanes into super storms, produce droughts, wipe out the polar bears and result in bleaching of coral reefs. He tells us tropical diseases will spread to mid latitudes and heat waves will kill tens of thousands. He preaches to us that we must change our lives and eliminate fossil fuels or face the dire consequences. The future of our civilization is in the balance. Got that? Al Gore. Al Gore. Al Gore. Al Gore. Al Gore. Al Gore. Al Gore. This is pretty embarrassing. Coleman claims to have read so much AGW research, but then proves in this paragraph that the only thing he’s read is Al Gore’s An Inconvenient Truth. I didn’t read the book myself, but I’m pretty sure it had a lot of pages in it, and those page numbers can get pretty complicated for some people when we’re talking about numbers as big as 104 power, but this doesn’t excuse the silliness of AGW skeptic’s tactic of claiming Al Gore is the end-all-be-all of AGW theory. I don’t recall Al Gore’s name being on any of the scientific papers. I don’t recall Al Gore owning the NASA Earth observation satellites. And Al Gore’s name definitely wasn’t on the IPCC reports. So take note, whenever an AWG skeptic says “Al Gore,” what they’re telling you is, “I don’t believe in Global Warming because I can’t be bothered to read primary sources.” Then imagine them drooling on themselves and drawing doodles of bunny rabbits. Carbon Dioxide “is not a pollutant. It is not smog. It is a naturally occurring invisible gas.” Coleman argues. It’s a byproduct of our respiration; therefore, it doesn’t matter how much of it is in our atmosphere. I would like Coleman to demonstrate his faith in this fact by placing himself in a room filled with nothing but CO2 for 10 minutes. After he expires, we can discuss why his whole “it’s natural” argument is bogus. Remember: arsenic is natural. Coleman also trots out the “controversy” surrounding the AGW consensus, citing that tired old Oregon Institute of Science and Medicine’s 31,000 signatures of “Scientists” who dispute AGW Theory. Although released on May 2008, this is actually the same list released in 1998, which was heavily debunked then and carries no more legitimacy now. But what does all this have to do with the price of oil? The battle against fossil fuels has controlled policy in this country for decades. It was the environmentalist’s prime force in blocking any drilling for oil in this country and the blocking the building of any new refineries, as well. So now the shortage they created has sent gasoline prices soaring. This is important, because it’s possible that there is as much as 3.5 billion barrels of oil underneath the Alaskan National Wildlife Reserve, 3.5 BILLION. That’s almost enough oil to supply America for a whopping half a year!!! And we evil environmentalists are keeping you from it. Why would we do that? Why would anyone want to deny Americans a few more years of driving our SUVs just so we can have healthy forests, clean beaches, and wildlife??? In dittohead land, one skeptical meteorolgist is enough to overturn the G8, Brazil’s Academia Brasileira de Ciéncias, France’s Académie des Sciences, Italy’s Accademia Nazionale dei Lincei, Russia’s Academy of Sciences, the United State’s National Academy of Sciences, United States of America, the Royal Society of Canada, the Deutsche Akademie der Naturforscher Leopoldina, the Science Council of Japan, the Academy of Science of South Africa, the Chinese Academy of Sciences, the Indian National Science Academy, the Academia Mexicana de Ciencias, the Royal Society, United Kingdom, Malaysia’s Academy of Sciences, New Zealands, Academy Council of the Royal Society, the Royal Swedish Academy of Sciences, the Australian Academy of Sciences, the Woods Hole Research Center, the Intergovernmental Panel on Climate Change (IPCC), the United Nations Framework Convention on Climate Change (UNFCCC), American Association for the Advancement of Science (AAAS), the American Meteorological Society (AMS), the National Research Council, Canadian Meteorological and Oceanographic Society (CMOS), the Federal Climate Change Science Program, the National Oceanic and Atmospheric Administration (NOAA), the UN Project on Climate Variability and Predictability, the American Geophysical Union, the Geological Society of America, American Chemical Society, the American Association of State Climatologists, the US Geological Survey (USGS), the National Center for Atmospheric Research (NCAR), NASA’s Goddard Institute of Space Studies (GISS), the World Meteorological Organization, Canadian Foundation for Climate and Atmospherice Sciences, the Environmental Protection Agency (EPA), the Australian Meteorological And Oceanographic Society, the Pew Center on Climate Change, and 928 peer reviewed scientific journal papers. But in dittohead land, it’s the people who don’t believe John Coleman who are acting on faith. Last night I did my regular routine of working the stationary bike to get my three aerobic exercise sessions in for the week (I do weight training the other three times). For one hour I kept my RPMs above 85, managing over 20 miles in one hour. I lost two pounds of water weight from sweating in that time, and I burned a little over 500 calories. That hour of intense effort barely made up for the Hostess Zingers I ate after lunch (470 Calories). When I add in the Caramel Machiato coffee I got from Starbucks that morning (340 Calories), my dieting outlook gets bleaker. If I were to add just one signature burger, fries, and milkshake from McDonalds to this picture (1,500 Calories), I’d bust my limit on a 2,000 calorie daily diet by 300 calories, and there’s still a whole meal, or two, we need to fit into this food schedule. If 3,500 calories translates to one pound of fat, then such a diet would doom me to obesity very quickly, just as it brings down so many others in today’s society. Dieting is complicated. So be sure to keep up on the math involved. My personal Basal Metabolic Rate (BMR) is 2040 ((weight X 10) + (weight X 2)). Take a moment to figure yours out, then take some simple mental notes using the nutritional facts listed on food containers and the numerous calorie-counters available online. Just that much education could convince you to give up that visit to the snack machine, or choose peanuts instead of straight sugar. Add distilled water to the tank. Added nutrient pack, which is like a tea bag. Nutrient pack floats. Accidentally popped it trying to get it to submerge. Particulate, sticks and twigs, are floating in water. Added eggs. Eggs clump together on water’s surface. 0900: No life yet. Eggs still floating. Dropped water droplets on some of them to submerge, but they float right back to the surface. 1400: Life! A little white dot jiggling up and down and around the tank. About 1mm in size. It pushes its way through the ater rather than swims. 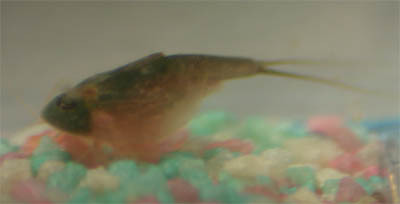 1100: There are now two triops in the tanks. The one from yesterday has doubled in size to 2mm, and it now swims much more smoothly. Younger counterpart still in the ‘pushing through water’ phase. 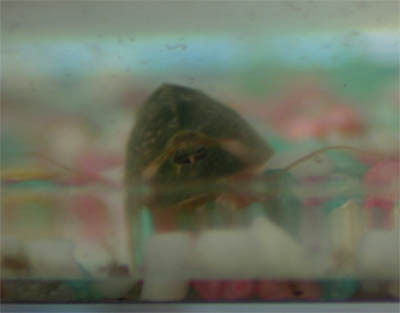 1340: Just counted four triops in the tank. 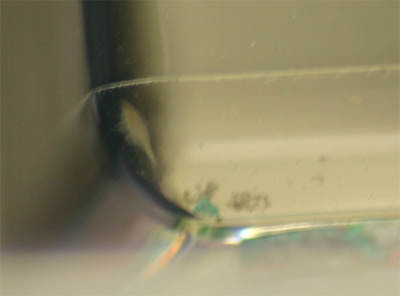 1700: Trying to photograph triops. Keep getting blurry dots. 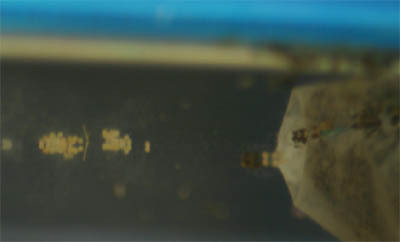 One triops swam close to the egg cluster and got stuck in the mucous-tendrils that spread out from it in the water. 0800: Crushed two food pellets and added them to the tank. 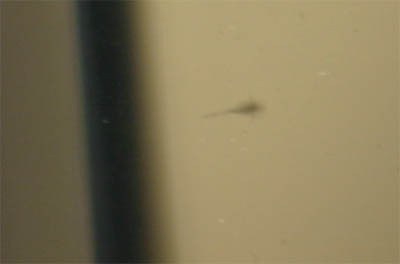 0930: The first hatchling is now 4mm long and 2mm wide. I’ve decided to name it Spaz because it swims crazily all over the tank. Other triops are hard to find. Only observed one other, the size of a hatchling. Spaz must have eaten the others. This suggests and evolutionary advantage to being the early-born triops, and getting the size jump on your siblings so you can eat them. 0500: Removed nutrient pack. Spaz is the only triop in the aquarium. It has even eaten most of the eggs at the surface. I put several crushed pellets worth of food in the tank for the weekend. Took apart nutrient pack. It’s all twigs. Don’t know why the directions have you treat it like toxic waste. 1000: Spaz is huge and still a spaz. One inch long. Head antenna and tail antenna are very visible. Added four food pellets. During the day, Spaz will grab one from the surface and pull it down to munch on it. 1700: Fed Spaz four pellets. It took one and nibbled on it upside down, rolling it over and over in its legs. 1200: Spaz ate two pellets given this morning, out of four. It is two inches in length now. Carapace is solid. Spaz swims like a dolphin, up and down, rather than like a fish, side to side. Mandibles are clearly visible as well. They look like big white buckteeth. 1400: Six food pellets from this morning are gone. Spaz is still two cm long. Two and a half counting tail antenna. 1430: Noticed a shell at the bottom of the tank. Spaz has shed its outer layer since yesterday. 0815: Put a dab of tuna into the tank. Spaz jumped right on it, and then went crazy swimming around the tank. 0850: Tuna has been torn to little pieces, which Spaz continues to munch on. 1700: Dumped a bunch of tuna and triops food (12 pellets) into the tank before leaving for the weekend. 0800: Spaz is dead, lying upside down at the bottom of the tank. All food pellets in the tank are eaten, but the tuna is untouched. I suspect the tuna was responsible for Spaz’s death. 1730: I have preserved Spaz in a test tube filled with 70% Isopropyl Alcohol. Future Plans: I still have half the eggs left and another nutrient pack. Intend to try the whole thing again very soon. Can you spot the rare and magnificent endangered species in the photo below? 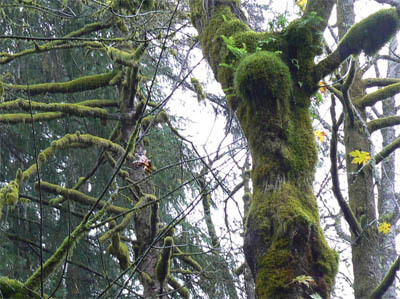 The Pacific Northwest Tree Octopus is not officially on the endangered species list; however, this extremely rare and biologically unique cephalopod inhabits a very small area in the coniferous Olympic rainforests west of Seattle, an area threatened by suburban sprawl and an encroaching logging industry. You can see other sightings here, and there’s a pretty amazing video of the PNTO in action here. 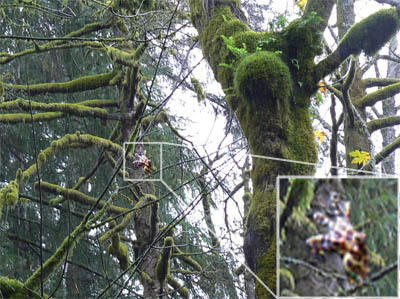 To read more about the Pacific Northwest Tree Octopus’ unique behaviors and lifestyle go here. Spent yesterday setting up a wordpress.org blog and transferring everything I’ve written on wordpress.com over to it, AND IT WAS SO EASY!!! It’s about an afternoon’s worth of work. WordPress.com lets you export all your blog content to an XML file, which you have to cut down to several 2MB XML files and upload one by one. The import will copy all your images over from your wordpress.com blog, and it preserves comments, categories, tags, etc. Once everything was imported, it was a matter of installing the necessary widgets to show my flickr photos, twittering, etc. There was also some setting-tweaking to get wordpress to use descriptive links with slugs and set up the dashboard, and I did have to run through all my blogposts and re-embed the videos, since wp.com has it’s own odd way of embedding to prevent users from installing malicious code in their blogs. The biggest hitch was when I finally transferred my domain name to the wordpress.org site. I had failed to change the settings in wp.org to use ideonexus.com, which was causing wordpress to crash. Luckily, bluehost.com technical support does weekend hours, and directed me on how to fix it. Sorry to everyone for the blog being down between 3AM and 11AM today. “A genuine science community is emerging online,” says science blogger Ryan Somma author of ‘ideonexus’. He argues that social networking also increases scientists’ accessibility to the public and accelerates the dissemination of new research. This is a bit awkward, seeing as how I recently knocked on the ABC for hosting science quacks. Chris Mooney has an important article online about how scientists debating fringe groups like Creationists and AGW deniers in many ways actually hurts our causes. A very astute observation of Dittohead reasoning. The fact that science does not have any peer-reviewed publications supporting the existence of god or disproving AGW Theory is only proof, in their minds, that the vast liberal conspiracy is in full effect, suppressing the “facts” they so desperately need to be true in order to prop-up their pre-defined ideological assumptions. With Dittoheads–and that is who we are talking about primarily–debate is always a futile effort. How do you argue with someone who doesn’t even share the same factual foundation as the rest of the world? People who dismiss peer-reviewed research as liberal bias, who rationalize away hard facts as subjective, and take the absence of media and scientific coverage as support for their positions? Mooney’s recommends science bloggers start ignoring the cranks as the best strategy for marginalizing them. I agree, but would also like to offer another tactic that I personally adhere to and one I think other bloggers should adopt: stop treating these cranks with respect. The problem isn’t that science bloggers are pointing out the irrationality, lack of scientific evidence, and blatant rhetorical abuses of the Cranks. The problem is that they are doing so in a competent, fairly respectable, and dignified manner. That’s what makes the cranks feel legitimized. When John Coleman can get up in front of an audience of AGW skeptics and argue that other people should sue Al Gore for his warnings about Global Warming, without having the spine to sue Al Gore himself, and he says this with a straight face, it’s time for bloggers to drop the academic tone and start laughing these people out of the room. Absurd statements like this prove that John Coleman is a spineless dweeb. He deserves a spanking and a “Dunce” cap, not a measured, respectful response. First-tier bloggers like Mooney, Nisbet, PZ Meyers, etc shouldn’t stoop to this level, and neither should second tier science bloggers. It’s important legitimate science remain above the fray. Scientists are the keepers of data integrity, and I agree with Mooney that it’s best if they simply start ignoring the cranks. Leave it to the third/fourth-tier bloggers like myself to openly ridicule these dimbulbs, as I personally have done here, here, here, here, and here. These are just my way of marginalizing what has become and increasingly silly cluster of conspiracy odd-balls. At the museum’s center is a huge recreation of North Carolina’s many ecosystems, filled with both living and taxidermied animals. 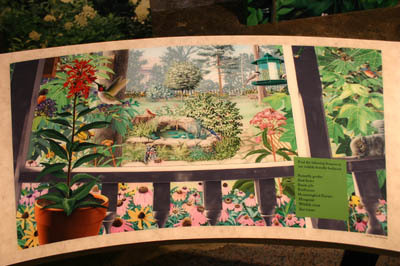 One of my favorite side displays was on how to build an eco-friendly yard that invites, feeds, and shelter’s wildlife. Offer a year-round food supply along with a variety of feeders. Native plants that seasonally produce seeds, berries, nuts, and flower nectar are ideal. Provide water for drinking and bathing. Watering holes can be a simple shallow saucer on the ground or an elaborate minipond. Provide a place to rest and escape predators. Evergreen shrubs and thick vegetation lend protection to wildlife–as do rock and brush piles. Create nesting spots; some animals have specific needs. Add birdhouses and leave dead trees standing when possible.